Call of Duty: World at War goes back to its World War II roots, focusing on the war in the Pacific Theater and the fall of Germany to Russia. There are two campaigns, one of which is seen from the eyes of Pvt. Miller of the United State Marine Corps as they battle the Japanese Imperial Army, and the other is seen from the eyes of Pvt. Petrenko, a member of the Soviet Red Army as they invade Germany. The game is decidedly more mature in almost every aspect in comparison to previous entries in the series. There is a lot more blood, gore, and language this time around. Not to mention the fact that the story also takes on a darker tone as well. **Minor Spoiler** To give you an example of the darker tone, the opening scene depicts torture, where a Japanese soldier extinguishes his cigar into a Marine’s eye and then proceeds to slit his throat. Also, there is a scene where you are asked to either shoot surrendering Nazis or allow your comrades to burn them alive with Molotov Cocktails. In addition, the unorthodox Japanese fighting methods of WWII are fully represented here, from charging Banzai attackers, to the well-known kamikaze fighter pilots. 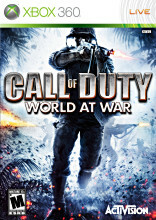 This game represents war in a very realistic manner probably more so than any other previous game in the Call of Duty series. This game does feature a lot more blood than previous Call of Duty entries and for the first time in the series there is also flying body parts. Although this game is not nearly as bloody and gory as other shooters on the market, it makes up for it with a scene of torture and in my opinion a murderous choice that is presented in the Russian campaign. This game is not for the faint of heart. This game does feature bad language and it is used often throughout. I encountered the following words: F***, Damn, Hell, Sh*t, and I heard the Lord’s name used in vain twice, one of which is GD. There is no sexual content in this game. World War II, or any war for that matter, is not where you can find the best of humanity. War is gritty, bloody, and extremely violent. The scene where you are asked to either shoot the Nazis or let your comrades, who are fueled by revenge, burn them to death can be a bit of a moral dilemma. Parents, if your children are under 17 and you have allowed them to play any of the previous entries in the Call of Duty series you need to strongly evaluate this title as it is bloodier and features more bad language than previous Call of Duty games. Therefore, I would recommend that parents respect the M rating with this game.